Žepče is a city and municipality located in Zenica-Doboj Canton of the Federation of Bosnia and Herzegovina, an entity of Bosnia and Herzegovina. It is situated in central Bosnia and Herzegovina, between Doboj and Zenica. As of 2013, it has a population of 31,582 inhabitants. The river Bosna flows through this ciy. Near by the town and within the town, there are 14 springs of mineral water. Žepče is in the valley and surrounded by mountains. The town was first mentioned in 1458 in a charter issued by the Bosnian king Stjepan Tomašević, "... Pissanna Žepču va ljetu 1458. oktombrija 14. dan." (Written in Žepče in the year 1458. 14.day of October)". 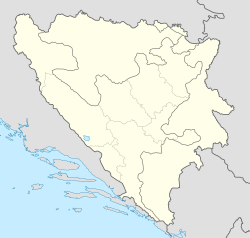 During the Yugoslav Wars in the 1990s, almost the whole town was destroyed. In 2001 the following Croat villages from the municipalities of Maglaj and Zavidovići merged with the municipality of Žepče to form one entity with Croat majority: Adže, Pire, Ponijevo, Matina, Ljubatovići, Grabovica, Čustovo Brdo, Komšići, Radunice, Globarica, Brankovići, Donji Lug, Gornji Lug, Vrbica, Debelo Brdo, Osova, Vinište and Gornja Lovnica. The town is home to local football club NK Žepče. Wikimedia Commons has media related to Žepče.